The 2017 Norma Minch Andrisek Leadership Conference gave more than 400 women the opportunity to learn, lead and live our rich history at the historic site of Delta Zeta Sorority’s founding at Miami University in Oxford, Ohio. As a donor to the Delta Zeta Foundation, you helped to make this possible. The Norma Minch Andrisek Leadership Conference is a step toward lifelong learning for the collegiate leaders in Delta Zeta Sorority. They discover that maintaining the desire to learn throughout their lives is the way to build leadership skills, to stay open to different perspectives and to keep growing as women and global citizens who contribute to the world community. 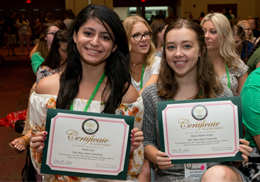 The conference’s learning objectives followed the tenets of Delta Zeta’s Strategic Plan: Grow (defining and applying “Authentic Leadership”); Enhance (applying a leadership profile to their own leadership journey); Improve (increasing understanding of mindfulness and wellness activities); and Advance (establishing personal leadership and chapter development plans). Participants explored the ability to think in more complex and strategic ways – a skill that is much needed on college campuses and in our world. Facilitators also challenged participants to be sure their chapters are places in which all members are encouraged and empowered to lead at different times and in different ways. Delta Zeta is guiding members in their own development. They are preparing themselves to lead in a rapidly-changing world by thinking in new and different ways as they interact with their sisters, co-workers and other members of their potential network in a meaningful way to make a difference in the world. A special tribute was given to Norma Minch Andrisek, for whom the conference is named. A Past National President who served an unprecedented three terms and a member of the Order of the Laurel, Delta Zeta’s highest honor for service of exceptional merit, Mrs. Andrisek founded the conference in 1980, and was adamant that “these were to be ‘leadership conferences,’ not ‘officer training conferences.’” Mrs. Andrisek’s quiet but powerful leadership style was explored during the conference as a lesson from which the collegians could learn.